President Trump insists US will remain in Syria to ensure Iran's departure. Will US be drawn into next major battle in northwest Syria? As the Iranian-Russian-backed pro-Assad coalition in Syria is gearing up for the long-anticipated offensive against Sunni Islamist rebels in the northwestern province of Idlib another decisive battle seems be in the making which could possibly involve the US military. After having regained control over southern Syria where the Iranian-led pro-Assad coalition seized the last pockets of Islamist resistance at the beginning of August, Assad’s forces are now amassing in northern Latakia, northeastern Hama and the southwestern countryside of the Aleppo province. The Syrian and Russian air force have already begun bombing positions of Hayat Tahrir a-Sham a large coalition of Sunni Islamist militias dominated by Jabhat Fatah al-Sham, the former Al Qaeda branch in Syria which was previously known under the name Jabhat al-Nusra. Pro-Assad media in Syria reported on Wednesday that the force which will launch the ground assault on Idlib will be three times stronger than the coalition of pro-regime militias which ‘liberated’ the Daraa and Quneitra provinces in southern Syria. Once the ground offensive in Idlib begins “the Syrian army will deliver blows unprecedented in the history of the Syrian crisis to the positions and fortifications of the militants,” according to the Syrian Observer. The same outlet said Turkey should withdraw its forces from Idlib and warned Ankara to remember the fate of the allegedly US-backed rebels in Ghouta and Daraa in southern Syria who were deported to Idlib under so-called reconciliation deals with the Assad regime. The Trump administration on Wednesday issued a clear warning to the Assad regime not to use chemical weapons during the Idlib offensive or face another devastating American attack with Tomahawk cruise missiles and other precision weapons. “Just so there's no confusion here: if the Syrian regime uses chemical weapons, we will respond very strongly, and they really ought to think about this a long time,” Trump’s national security adviser John Bolton said during a press conference in Jerusalem. The last time Assad used chemical weapons against the Syrian population was in Ghouta in August 2017 when the regime reportedly used the agent Sarin to break the resistance of the Islamist rebels. Two other areas where Assad still hasn’t succeeded to restore his rule are the al-Tanf area along the Syrian Iraqi border where the U.S. military is working with tribal groups in order to prevent a de-facto Iranian take-over of the border region and the territories held by US-ally the Kurdish-led Syrian Democratic Forces (SDF). These areas make up 30 percent of Syria's land mass and Assad has already issued an ultimatum to the SDF: negotiate (a surrender deal) or face the (Syrian) military. The Kurds, however, are interested in reaching a ‘political solution’ and rightly point out that they’ve never attacked the pro-Assad coalition and are only interested in consolidating their autonomy. “We have never attacked the regime, so what excuse does the regime have to attack us?” asked Ilham Ahmad a member of the Syrian Democratic Council, the political arm of the SDF. The survival of the independent Kurdish cantons along the border with Turkey and Iraq in Syria is now dependent on the United States which has an estimated 4,000 Special Forces in what is called Rojava, the Kurdish autonomous region in northern Syria. If Trump would have made good on his earlier promise to withdraw the US military from Syria the Kurds would have been left with no other option than negotiate a ‘reconciliation deal’ with the Assad regime. In an about-face the U.S. this week finally made crystal clear that after the partial defeat of ISIS – the Jihadist terror group has lost its ‘caliphate’ but is still operating in both Syria and Iraq- preventing Iran from gaining a permanent foothold in Syria and elsewhere will be the new cornerstone of Trump’s Middle East policy. If this is indeed the new US strategy in the Middle East, the US military should begin by retaining its foothold in eastern and northern Syria because that’s where Iran is trying to finalize its so-called land bridge from the Iranian border in the Nineveh province in Iraq all the way up to the Israeli border on the Golan Heights. SDF spokesman Nuri Mahmoud is confident this is precisely what will now happen. “We have been in a coalition with the US since the Kobani battle. There has been media speculation regarding imminent withdrawal. Putin also once said that his forces were leaving, but the opposite took place,” Mahmoud told Middle East expert Jonathan Spyer. “Syria today is a place of international confrontation in which all forces seek to strengthen their allies on the ground. The US will not leave Syria without stability on the ground. We see no evidence of imminent withdrawal,” the SDF spokesman added. Trump has reportedly told Russian president Vladimir Putin US troops will remain in Syria until the Iranians fully withdraw from the devastated country. Putin told Trump in July that “that he would be content to see Iranian forces all sent back to Iran,” but could not do it “by himself,” an indication the Russian president would condone Israeli and American strikes against the ‘Syrian army’ which has been transformed into another Iranian proxy force. Iran, meanwhile, continues to work on its contiguous land corridor to the Israeli border on the Golan Heights. 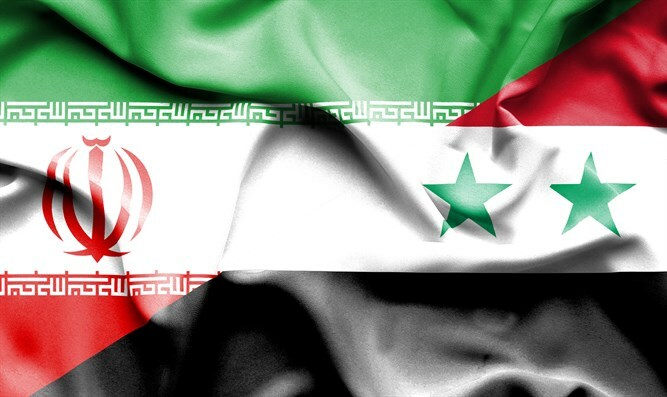 “Iran, not Russia, is the dominant actor in Syria,” Orit Perlov of the Institute for National Security Studies wrote in a recent research paper. Perlov described how the Quds Force of the Iranian Revolutionary Guards Corps deceived Israel, the Russians and the United States by using Shiite militias disguised as Syrian army soldiers during the offensive which brought Assad back in control of the Israeli and Jordanian border. In Iraq too, Iran is also working to finalize its land bridge to the Israeli border. The Hashd al-Shaabi umbrella organization of predominantly Shiite militias in the country this week seized large swaths of territory adjacent to the Syrian border while carrying out a purge against anti-Iranian Sunni rebel groups. Israel has now gotten a formal green light by the Trump administration to continue its military actions against the Iranian entrenchment in Syria.